Playing hockey as a teen, Dr. Sarah was hit from behind causing her to miss a week of school due to her injuries. Her father took her to the chiropractor who treated her full spine and helped her recover from her injury. That’s exactly what Dr. Sarah does. 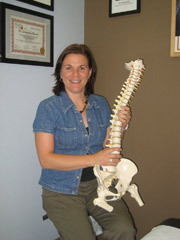 She attended the Canadian Memorial Chiropractic College in Toronto and since graduating in 2004, Dr. Sarah has been providing family care from head to toe to those in Barrie, Ontario. She’s passionate about educating and empowering individuals to take control of their health journey by improving who they are. With her Bachelor of Science in kinesiology and her certifications in personal training, she uses her experience and education to provide work ergonomic advice and specific strengthening exercises to interested patients. To pursue academics, she opted out of a promising hockey career involving Team Canada selection camps and being a member of Team Ontario. As an athlete herself she enjoyed volunteering as a therapist for a university rugby team. She’s now the proud mom of two future NHLers and one ballerina! That means any spare time is spent at the hockey rink or dance competitions. When she can, she enjoys practicing yoga and getting outdoors to hike. Wondering how Dr. Sarah can help you live a better life? Give us a call today and let’s find out.